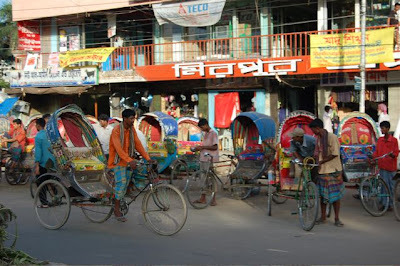 My friend Holly has been shooting a documentary in Bangladesh and sent me these photos and commentary about bicycle culture in that country. Since Bangladesh is the most densely populated country on earth and also has the least cars per person (fact told to me by my ever interested in statistics father), you will understand why Bangladeshis have a close relationship with the bicycle. 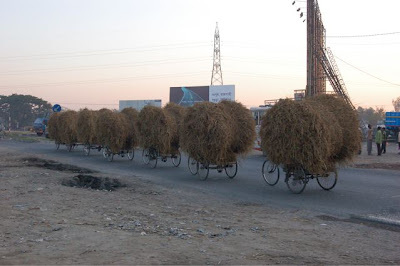 One of the most common jobs is to be a rickshaw driver, as you can see from the examples here. less than 30 cents. 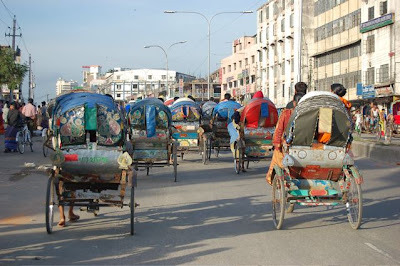 are many forms of the rickshaw, from the one we most commonly see with the "two seater and shaded back" which is always highly decorated. They also come in forms with two benches on the back so that up to six people can sit facing each other. Or of course you can use them to carry anything from goats and eggs to the common hay bushels as seen here. 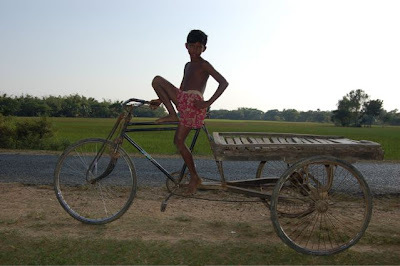 I have to say that Bangladesh must be the most Vélo Vogue country in the world. 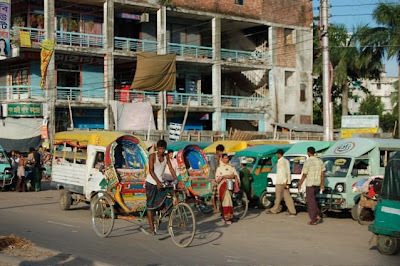 The rickshaw drivers manage to climb over male style bicycles in the lunghi which is a male style skirt. They effortlessly get on the bike standing with one foot on a peddle and swing the other knee up and over as if they all are yogi masters with flexibility and agility. Their calves are made of steel and they would give Lance Armstrong a run for his money if they were to race. Although Bangladesh is mostly flat countryside, but I think after hauling such loads, they would take to the hills effortlessly as well.